Updated Nov. 30 with the value of DARPA’s contracts with Telesat, Airbus Defence and Space and Blue Canyon Technologies. WASHINGTON — The Defense Advanced Research Projects Agency has awarded satellite operator Telesat a contract to study the use of commercial buses in the agency’s experimental low-Earth-orbit constellation program known as Blackjack. Telesat of Ottawa, Canada, is the third company to receive a study contract for Blackjack, a DARPA demonstration mission that envisions deploying 20 satellites — each carrying one or more payloads. DARPA’s goal is to find lower cost alternatives to traditional military satellites. DARPA aims to pay no more than $6 million per satellite, including launch. European satellite manufacturer Airbus Defence and Space and small satellite manufacturer Blue Canyon Technologies of Boulder, Colorado, received similar contracts over the past four weeks — Airbus for $2.9 million and Blue Canyon for $1.5 million. Telesat’s $2.8 million contract, which the company announced Nov. 27, is a 12-month study to assess the utility of Telesat buses as the company refines its plans for a constellation of roughly 300 small, broadband satellites. Telesat has yet to select a manufacturer for its satellites. Two contenders, Airbus Defence and Space and a team formed by Thales Alenia Space and Maxar Technologies, are competing to build an unspecified number of satellites. Michael Schwartz, Telesat’s senior vice president of corporate and business development said the company still plans to down select a manufacturer in the spring. 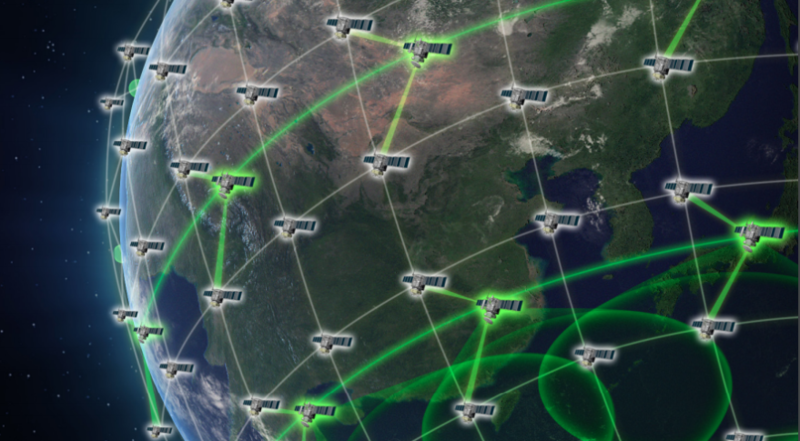 The DARPA study includes evaluating the use of intersatellite links on Blackjack satellites that would enable them to connect with Telesat’s constellation, which will also have intersatellite links for in-space communications. Telesat has been working on a LEO constellation since 2015. As large commercial constellations from Telesat, SpaceX, OneWeb and others gain traction, government agencies have given renewed attention to learning how they too can make use of such systems. DARPA’s track record with small satellite programs leaves room for concern, however. DARPA canceled a smallsat program called the F6 System in 2013 after investing close to $200 million. Another, DARPA’s SeeMe program, envisioned 24 remote-sensing satellites in LEO but was canceled in 2015 after two years. Only one satellite was finished. Belle added that the Blackjack contract has potential to create new business for Telesat, nonetheless. “If the engagement is successful this certainly could give Telesat an upper hand in winning valuable DoD contracts for satcom services across its network, whether using Telesat satellites themselves or leveraging the system’s [intersatellite links] and satellite production capacity (e.g., keeping the satellite production lines running even when Telesat does not require replacement satellites, helping to maintain personnel and supply chain as well as keep costs low),” she said. Defense contractor Leidos will assist Telesat in fulfilling the DARPA contract, Telesat said in a press release. Telesat received an earlier contract Nov. 16 worth approximately $550,000 to help DARPA better understand “commercial, commoditized buses, their operational concepts, and to define their mechanical, electrical, and network interfaces,” Paul Thomas, DARPA’s project manager for Blackjack, said by email. Brown said that contract is for four months. Airbus and OneWeb, which together are building 900 small, telecom satellites, also received a study contract for the same purpose, Thomas said.